September 30, 2008 7:08 pm By Lori Post contains sponsored/affiliate links and I get commissions for purchases made from links. As an Amazon Associate I earn from qualifying purchases. Up until a few years ago, I had always assumed couponing was a waste of time. I can remember as a young married woman sifting through the Sunday inserts and finding coupons for things like overpriced vitamins, unnecessary cleaning items and frozen dinners manufactured by some company I’d never heard of! When I did find a coupon I could use, it was only a few cents off – so I figured what’s the point? Obviously, I wasn’t paying attention. Then one day I stumbled across a video that showed me how to save big bucks by combining store sales and coupons. It was a eureka moment. In this economy and with 5 kids to feed, I thought I’d give it a try. And the rest my friend, is history! As you collect coupons, keep in mind that you are purchasing to build a stockpile of nonperishables: canned goods, paper products, toiletries, etc. Think about setting a goal to have 3-6 months of these products on hand. By doing this you eliminate buying out of necessity which is when you pay the most. If you have a stockpile of shampoo, you’ll be able to wait until it’s free (or dirt cheap) before making a purchase. But if you’re out of shampoo, you’ll gladly pay the shelf price for it! Don’t worry, stockpiling won’t cost you any extra out of pocket. Just figure out how much you spend per month on these items and use that (or a portion of that) as your stockpile budget. I’ll show you how to make it s-t-r-e-t-c-h! The two best places to find coupons are the internet and newspaper inserts. Consider buying multiple copies of the Sunday newspaper. The general rule of thumb is one for every family member. If you live in a small town, you may want to purchase a newspaper from a nearby city if it is available as they generally have more coupons. You can preview the coupons that will be in upcoming newspapers HERE. Sometimes you hit the motherload, and some weeks I just skip buying the paper altogether. 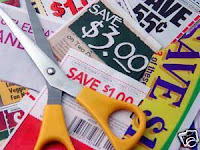 If you’d rather skip the hassle and expense of buying multiple papers and clipping coupons, use a coupon clipping service or buy your coupons on ebay! The three main sources for internet printables are Coupons.com, Redplum or SmartSource. You can also occasionally find them on the manufacturer’s websites. Moms by Heart shares news of all high-value printables so you’re sure to get the best ones! This is where I lose most people. I start to hear the it’s too hard/too confusing/I don’t have time excuses. Well, I’m not buyin’ it, sister! I’m not denying that it can be overwhelming at first. But it’s like anything else – you learn the ropes slow but sure, and get into a routine. Pretty soon it’s a breeze. Start by visiting Moms by Heart each Saturday morning to see my Walgreens coupon match ups. Plan to buy one or two things free with coupon until you feel comfortable enough to fill your cart with freebies. Softsoap hand soap is $2.29 and you have a $.35 off coupon. But when the soap goes on sale for $.99, using your coupon gets you 72% off the regular price! You’ll end up paying less for three than you normally do for one. The extra two go into your stockpile and you don’t have to buy hand soap until it goes on sale again! There are several frugal blogs that will do all the work of matching sale prices to coupons. You just need to clip ’em! OMG! You are awesome!!! Thank you so much for taking all of this time and putting in all your efforts to save us money!!! That’s a great coupon tutorial! Great advice… I’m going to follow your blog, my family is in financial crisis due to my husbands lay off so every penny counts more than ever. Thanks for breaking it down. It makes couponing so much easier to understand! I have a question regarding RR from walgreens. can you do a single transaction and get RR from multiple products? I just start collect coupon on newspapers in feb and I read a lot what deal week for walgreens , cvs , and rite aid..it save me money but I noticed that coupon from newspaper use 1/10 , 2/10 etcs something like that and I dont have it old newspaper coupon from past .. because I just start get newspaper.. can you tell me what i should do or should i look for old newspaper coupon from past ? that what my fiance told me about it but I want ask you not him. LOL! and I wonder is there that I can find old coupons on internet or at store? it my first do that . hehe! and i want to ask you one more question how long should i wait til I m establish? in next 2 months then ready? I have been wanting to try to use coupons. But what I don’t understand if you wait for an item to go on sale, don’t you have the chance of the coupon expiring? I am very confused as a matter of fact I use .50 cents, 1.00 coupon as I’m buying the item. I LIKE YOUR WEBSITE. I WOULD LIKE TO KNOW, WE ARE FAMILY OF THREE ,HOW MANY INSERTS DO I HAVE BUY TO SAVE MONEY. Hi Mugi – Each Saturday I write a coupon insert preview post where I share which inserts you can expect to find in Sunday’s newspaper. For us, I decide how many to buy based on the quality of the coupons.